Spectacular All Weather Lanai has both screening and glass. Captains Bay 102 also offers a screened-in front porch overlooking the pool. Relax In The Sunshine! 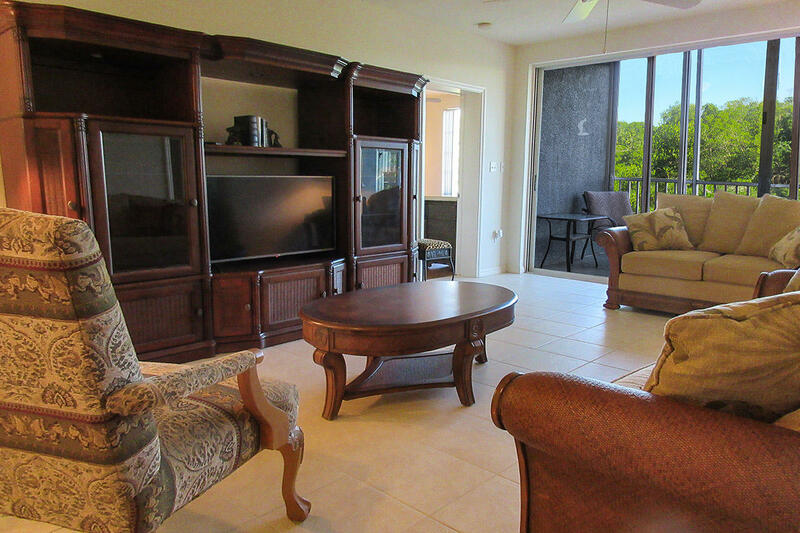 Lovely 2B/2B Vacation Condo w/ All Weather Lanai, Walk To Beach, Resort Pool! TWO WEEK MIN. 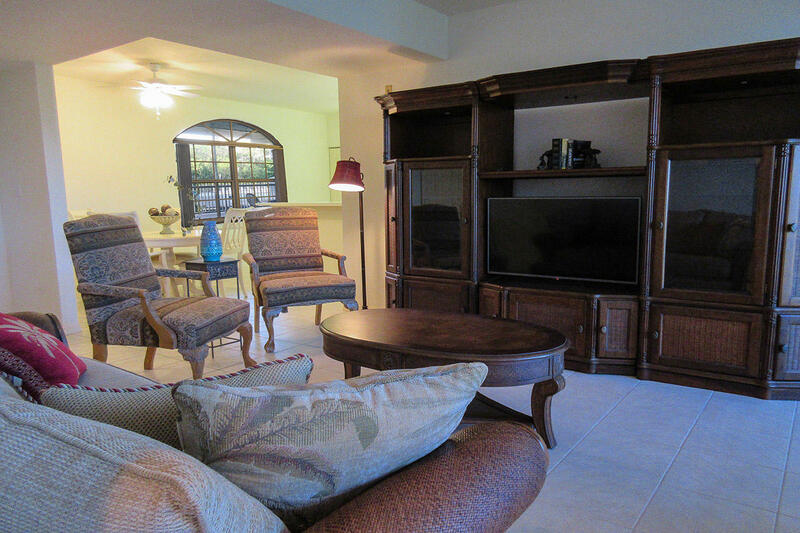 2B/2B Condo w/ Canal and Preserve View, King in MB, Two Twins in Guest, W/D in unit, Free WiFi. All weather Lanai plus screened in front porch, walk to beach. Captains Bay 102 is a fabulous way to spend your vacation! 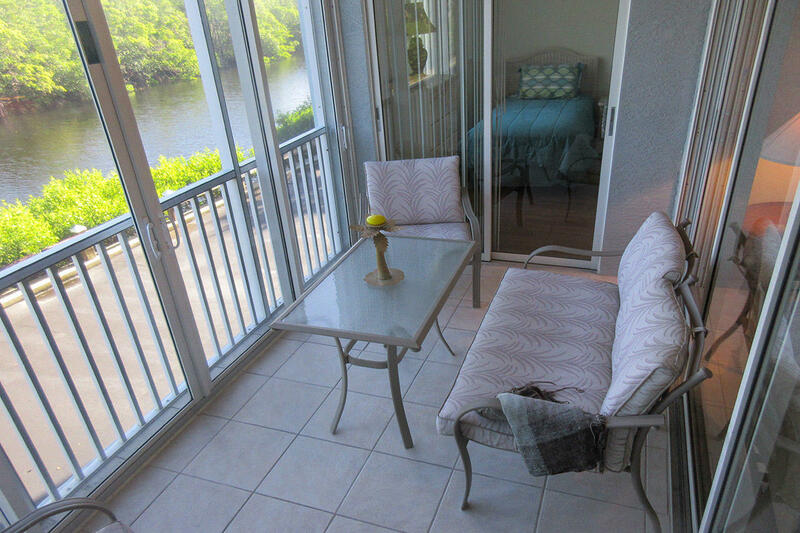 Beautifully decorated, this 2 Bedroom/2 Bath condo has a magnificent water view of the Preserve from nearly every room and some uniquely fabulous features that make Captains Bay 102 your favorite spot to relax in sunny Florida and come back to year after year. First you are greeted with a screened in porch just to the left of your front door. This porch overlooks the Captain's Bay Resort Pool and offers the perfect place to sit and relax and dine outside, especially if you are wet and sandy from the pool or beach and need some time to dry off before going inside. Open the front door and you are treated to an open concept living area with a fabulous water view of the Preserve and Bird Sanctuary and the canal that lines the area. 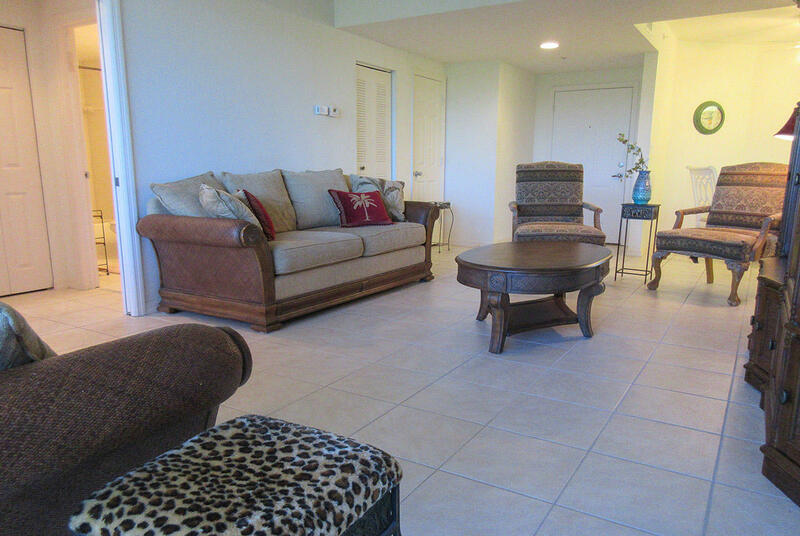 With tile throughout, this condo was recently decorated with brand new furniture. There's a dining area with a table for four and a lovely picture window. The bright, white, fully equipped kitchen has a dishwasher, microwave and plenty of counter space. The laundry room is just off the kitchen and boasts a full washer and dryer. 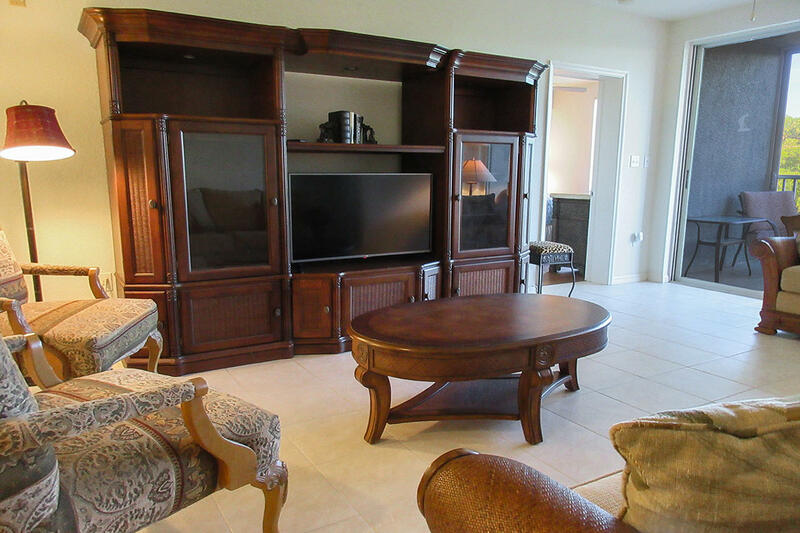 The spacious living room has comfortable seating, a large screen tv with cable, and leads to the best feature in the condo - an all weather lanai with floor to ceiling viewing of the preserve. When it's cool out, you can open the living room sliding glass doors and the lanai glass doors and treat the whole unit to fresh air. 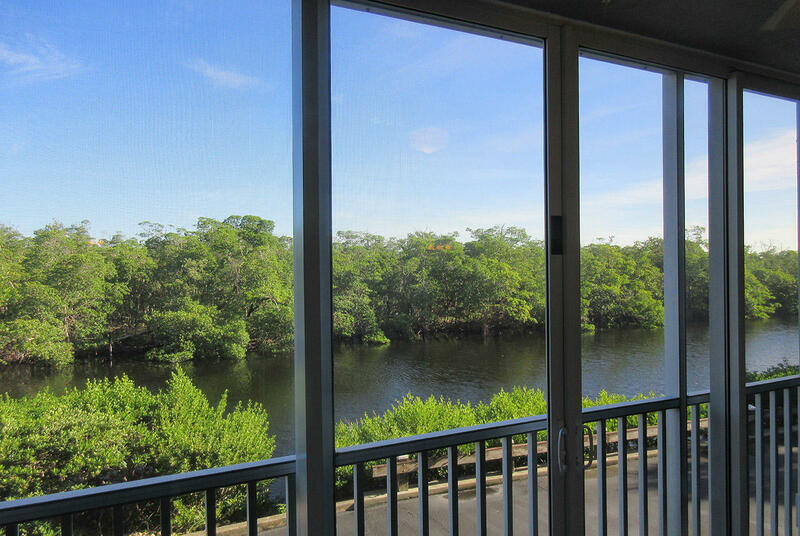 When it's hot and buggy, keep the lanai glass doors closed to enjoy the fabulous view in air conditioned comfort and NO BUGS! The lanai is your gateway to the preserve, where you can watch the rare birds of the island - egrets, herons, roseate spoonbils - nesting and feeding. The large master bedroom sports a king sized bed, a beautiful picture window with a view of the preserve, and its own TV, while the master bedroom walk in closet is enormous. The en suite master bath features dual vanities, and a separate room for the toilet and walk in shower. The guest bedroom is also rather large and hold two twin beds. 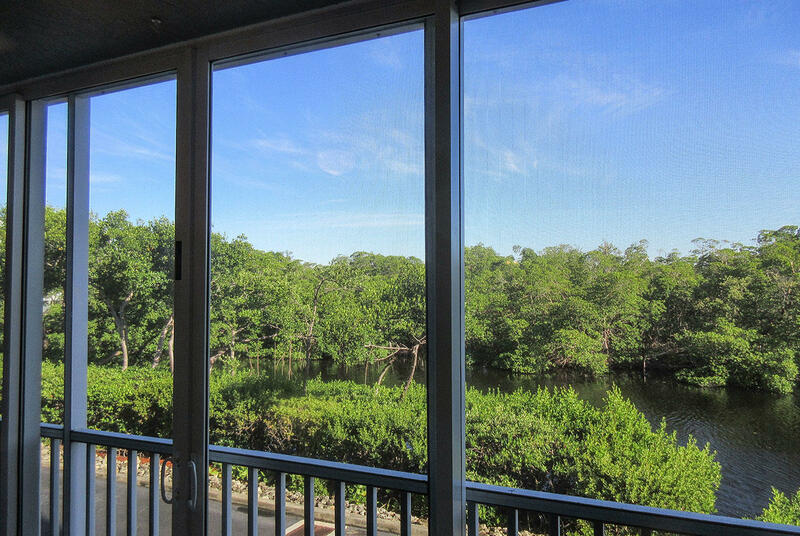 This bedroom also has a view of the preserve, and has its own private lanai access. Guest bath sits right next door. There is a pack-n-play for use if needed. This unit offers free WiFi, ample parking, a secured lobby, a building elevator, and a designated outdoor closet filled with beach chairs, umbrellas, and beach toys. Captain's Bay is a wonderful and welcoming community located in the quiet south end of Fort Myers Beach, just across the street from our world famous beach, and features resort amenities - tennis courts, heated pool and sundeck with lounge chairs, picnic area, BBQ grill. Restaurants, shopping, movie theater, marina and pharmacy are close by. As the property manager and rental agent for Captain's Bay 102 on Fort Myers Beach, Florida, Kathy Nesbit Vacations, Inc. offers the best in customer service and accommodations. We have been graciously greeting our guests from our familiar local office location on Fort Myers Beach for over 40 years and have earned our excellent reputation. Should any questions or concerns arise during your stay, you can stop by to see us. By popular vote, we have been named The Best Of Fort Myers Beach Winner for Real Estate Vacation Rental multiple times! The Kathy Nesbit Vacation Rental team has played hosts to thousands of guests and visitors to the Island over these many years and helped them to enjoy the best vacation experience possible. We love acting as tourism ambassadors for Fort Myers Beach! Kathy Nesbit Vacations, Inc. is proud to announce that this property has been officially registered with the Town of Fort Myers Beach and is compliant with all requirements and regulations. STR #19-1126.